The Murray Cove Boat Ramp is located near the shore of Lake Burton in North Georgia. Over a period of 10 years, multiple areas of soil cracking and sloughing have occurred along the crest, face, and toe of the slope. 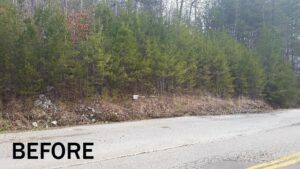 After further investigation, Georgia Power employees located an artesian spring along the slope’s face. The NOVA Team got to work, put on their thinking caps and provided multiple solutions to the client. NOVA’s Geotechnical Engineers conducted a site reconnaissance, soil test boring and sampling program, piezometer well installation and monitoring, laboratory testing, and an engineering evaluation, including a limited slope stability analysis. NOVA determined that the global factor of safety needed to be increased for the existing slope. 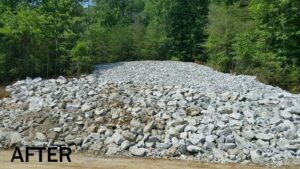 Option 2 – Remediate the slope using a soldier pile wall system. Based on engineering evaluation and analysis, NOVA presented option 1 as a greater value to the design and construction team. 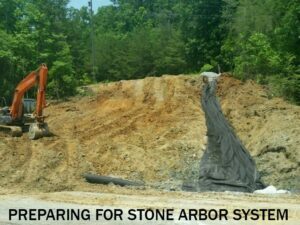 Comparing the costs of the two options, an approximate $40,000 savings in design and construction costs were achieved by using the stone armor system. The result… an extremely satisfied client.